Vegetarian sausage, to serve as a hot dog on a roll or as a snack with French fries. 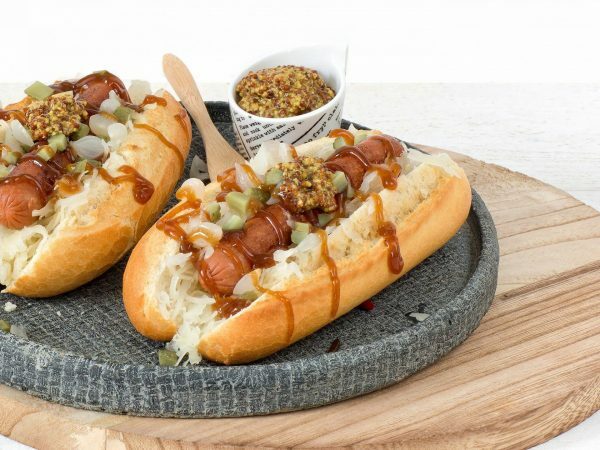 A vegetarian Frankfurter sausage weight per item 40 grams. Water, 15% vegetable protein (soy, wheat gluten), rapeseed oil, egg white*, natural flavouring, dried onion, rice bran, yeast extract, dextrose, salt, wheat flour, smoked water, extracts (onion, garlic, spice), sugar, mineral (ferrous fumarate), vitamin B12, colour (E172). * free-range eggs.